2. Either press the door handle button or press the Door Lock button (1) on the smart key. 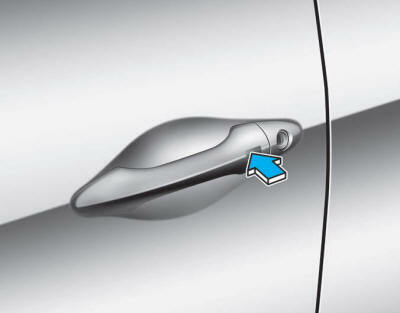 The door handle button will only operate when the smart key is within 28~40 in. (0.7~1 m) from the outside door handle. Any door except the tailgate is open. Do not leave the Smart Key in your vehicle with unsupervised children. Unattended children could press the Engine Start/ Stop button and may operate power windows or other controls, or even make the vehicle move, which could result in serious injury or death.